A common point of confusion is the overloading of the terms service and role for both types and instances; Cloudera Manager and this section sometimes uses the same term for type and instance. 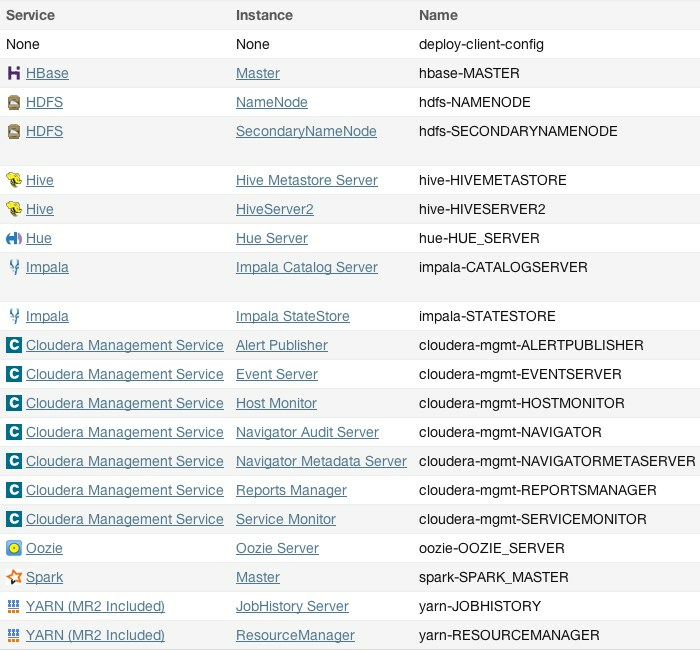 For example, the Cloudera Manager Admin Console Home > Status tab and Clusters > ClusterName menu lists service instances. This is similar to the practice in programming languages where for example the term "string" may indicate either a type (java.lang.String) or an instance of that type ("hi there"). When it's necessary to distinguish between types and instances, the word "type" is appended to indicate a type and the word "instance" is appended to explicitly indicate an instance. As depicted below, the heart of Cloudera Manager is the Cloudera Manager Server. The Server hosts the Admin Console Web Server and the application logic, and is responsible for installing software, configuring, starting, and stopping services, and managing the cluster on which the services run. Agent - installed on every host. The agent is responsible for starting and stopping processes, unpacking configurations, triggering installations, and monitoring the host. Database - stores configuration and monitoring information. Typically, multiple logical databases run across one or more database servers. 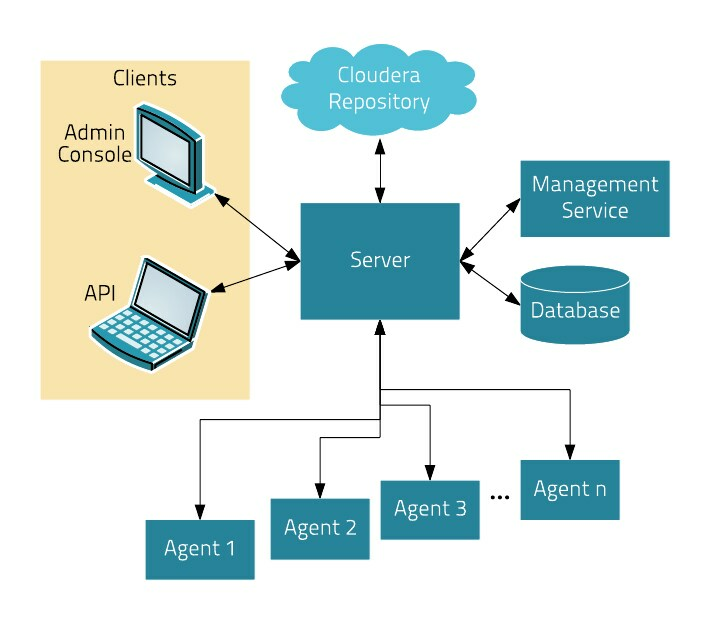 For example, the Cloudera Manager Server and the monitoring roles use different logical databases. Heartbeats are a primary communication mechanism in Cloudera Manager. By default Agents send heartbeats every 15 seconds to the Cloudera Manager Server. However, to reduce user latency the frequency is increased when state is changing. During the heartbeat exchange, the Agent notifies the Cloudera Manager Server of its activities. In turn the Cloudera Manager Server responds with the actions the Agent should be performing. Both the Agent and the Cloudera Manager Server end up doing some reconciliation. For example, if you start a service, the Agent attempts to start the relevant processes; if a process fails to start, the Cloudera Manager Server marks the start command as having failed. Runtime state is what processes are running where, and what commands (for example, rebalance HDFS or run a Backup/Disaster Recovery schedule or rolling restart or stop) are currently running. The runtime state includes the exact configuration files needed to run a process. When you select Start in the Cloudera Manager Admin Console, the server gathers up all the configuration for the relevant services and roles, validates it, generates the configuration files, and stores them in the database. When you update a configuration (for example, the Hue Server web port), you have updated the model state. However, if Hue is running while you do this, it is still using the old port. When this kind of mismatch occurs, the role is marked as having an "outdated configuration". To resynchronize, you restart the role (which triggers the configuration re-generation and process restart). While Cloudera Manager models all of the reasonable configurations, some cases inevitably require special handling. To allow you to workaround, for example, a bug or to explore unsupported options, Cloudera Manager supports an "advanced configuration snippet" mechanism that lets you add properties directly to the configuration files. You can set configuration at the service instance (for example, HDFS) or role instance (for example, the DataNode on host17). 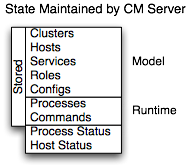 An individual role inherits the configurations set at the service level. Configurations made at the role level override those inherited from the service level. While this approach offers flexibility, configuring a set of role instances in the same way can be tedious. In addition to making it easy to manage the configuration of subsets of roles, role groups also make it possible to maintain different configurations for experimentation or managing shared clusters for different users or workloads. 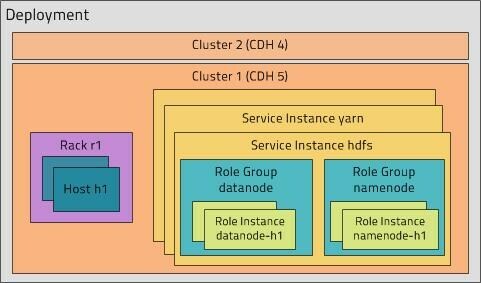 In a non-Cloudera Manager managed cluster, you most likely start a role instance process using an init script, for example, service hadoop-hdfs-datanode start. Cloudera Manager does not use init scripts for the daemons it manages; in a Cloudera Manager managed cluster, starting and stopping services using init scripts will not work. Stopping the Cloudera Manager Server and the Cloudera Manager Agents will not bring down your services; any running role instances keep running. These actions reinforce an important point: a Cloudera Manager process never travels alone. In other words, a process is more than just the arguments to exec()—it also includes configuration files, directories that need to be created, and other information. A major function of Cloudera Manager is to install CDH and managed service software. Cloudera Manager installs software for new deployments and to upgrade existing deployments. Cloudera Manager supports two software distribution formats: packages and parcels. A package is a binary distribution format that contains compiled code and meta-information such as a package description, version, and dependencies. Package management systems evaluate this meta-information to allow package searches, perform upgrades to a newer version, and ensure that all dependencies of a package are fulfilled. Cloudera Manager uses the native system package manager for each supported OS. Parcels are self-contained and installed in a versioned directory, which means that multiple versions of a given parcel can be installed side-by-side. You can then designate one of these installed versions as the active one. With packages, only one package can be installed at a time so there is no distinction between what is installed and what is active. You can install parcels at any location in the filesystem. They are installed by default in /opt/cloudera/parcels. In contrast, packages are installed in /usr/lib. When you install from the Parcels page, Cloudera Manager automatically downloads, distributes, and activates the correct parcel for the operating system running on each host in the cluster. All CDH and Cloudera Manager hosts that make up a logical cluster need to run on the same major OS release to be covered by Cloudera Support. Distribution of CDH as a single object - Instead of having a separate package for each part of CDH, parcels have just a single object to install. This makes it easier to distribute software to a cluster that is not connected to the Internet. Internal consistency - All CDH components are matched, eliminating the possibility of installing parts from different versions of CDH. Installation outside of /usr - In some environments, Hadoop administrators do not have privileges to install system packages. These administrators needed to use CDH tarballs, which do not provide the infrastructure that packages do. With parcels, administrators can install to /opt, or anywhere else, without completing the additional manual steps of regular tarballs. Note: With parcels, the path to the CDH libraries is /opt/cloudera/parcels/CDH/lib instead of the usual /usr/lib. Do not link /usr/lib/ elements to parcel-deployed paths, because the links may cause scripts that distinguish between the two paths to not work. Installation of CDH without sudo - Parcel installation is handled by the Cloudera Manager Agent running as root or another user, so you can install CDH without sudo. Decoupled distribution from activation - With side-by-side install capabilities, you can stage a new version of CDH across the cluster before switching to it. This allows the most time-consuming part of an upgrade to be done ahead of time without affecting cluster operations, thereby reducing downtime. Rolling upgrades - Packages require you to shut down the old process, upgrade the package, and then start the new process. Any errors in the process can be difficult to recover from, and upgrading requires extensive integration with the package management system to function seamlessly. With parcels, when a new version is staged side-by-side, you can switch to a new minor version by simply changing which version of CDH is used when restarting each process. You can then perform upgrades with rolling restarts, in which service roles are restarted in the correct order to switch to the new version with minimal service interruption. Your cluster can continue to run on the existing installed components while you stage a new version across your cluster, without impacting your current operations. Major version upgrades (for example, CDH 4 to CDH 5) require full service restarts because of substantial changes between the versions. Finally, you can upgrade individual parcels or multiple parcels at the same time. Upgrade management - Cloudera Manager manages all the steps in a CDH version upgrade. With packages, Cloudera Manager only helps with initial installation. Additional components - Parcels are not limited to CDH. Impala, Cloudera Search, LZO, Apache Kafka, and add-on service parcels are also available. Compatibility with other distribution tools - Cloudera Manager works with other tools you use for download and distribution. For example, you can use Puppet. Or, you can download the parcel to Cloudera Manager Server manually if your cluster has no Internet connectivity and then have Cloudera Manager distribute the parcel to the cluster. Once the services are deployed and running, the Hosts area within the Admin Console shows the overall status of the managed hosts in your cluster. The information provided includes the version of CDH running on the host, the cluster to which the host belongs, and the number of roles running on the host. Cloudera Manager provides operations to manage the lifecycle of the participating hosts and to add and delete hosts. The Cloudera Management Service Host Monitor role performs health tests and collects host metrics to allow you to monitor the health and performance of the hosts. Guarantee completion in a reasonable time frame for critical workloads. Support reasonable cluster scheduling between groups of users based on fair allocation of resources per group. Prevent users from depriving other users access to the cluster. With Cloudera Manager 5, statically allocating resources using cgroups is configurable through a single static service pool wizard. You allocate services as a percentage of total resources, and the wizard configures the cgroups. You can dynamically apportion resources that are statically allocated to YARN and Impala by using dynamic resource pools. YARN (CDH 5) - YARN manages the virtual cores, memory, running applications, and scheduling policy for each pool. In the preceding diagram, three dynamic resource pools—Dev, Product, and Mktg with weights 3, 2, and 1 respectively—are defined for YARN. If an application starts and is assigned to the Product pool, and other applications are using the Dev and Mktg pools, the Product resource pool receives 30% x 2/6 (or 10%) of the total cluster resources. 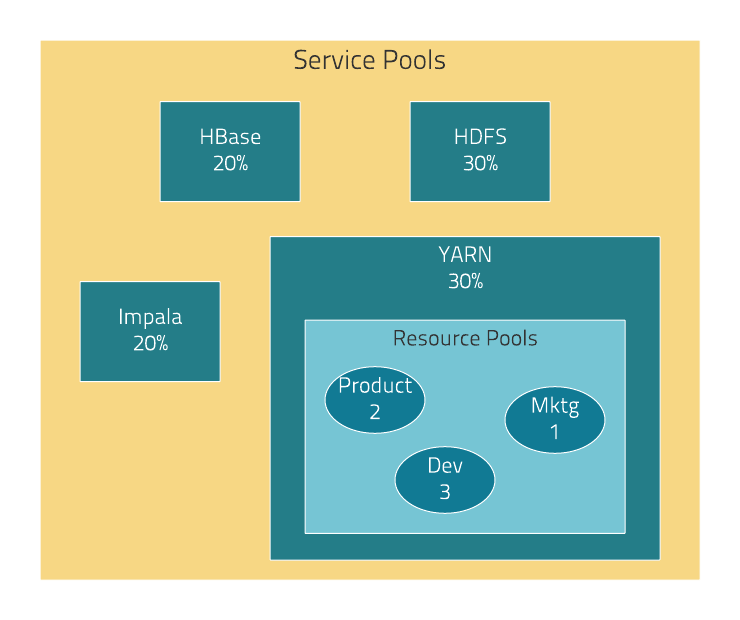 If no applications are using the Dev and Mktg pools, the YARN Product pool is allocated 30% of the cluster resources. Impala (CDH 5 and CDH 4) - Impala manages memory for pools running queries and limits the number of running and queued queries in each pool. For information about the privileges associated with each of the Cloudera Manager user roles, see Cloudera Manager User Roles. An alert is an event that is considered especially noteworthy and is triggered by a selected event. Alerts are shown with an badge when they appear in a list of events. You can configure the Alert Publisher to send alert notifications by email or by SNMP trap to a trap receiver.